baking pan, top it with the chocolate chips and sweetened condensed milk, and the top the whole thing with the rest of the cake mixture, like the picture above. After baking, it will look like this. Cool the bars completely before cutting into squares. They have a wonderful peanut butter flavor, which is perfect with the chocolate center, of course. Or, you can use peanut butter chips for an all the same flavor bar. So, these bars are delicious, but not what I was hoping for. 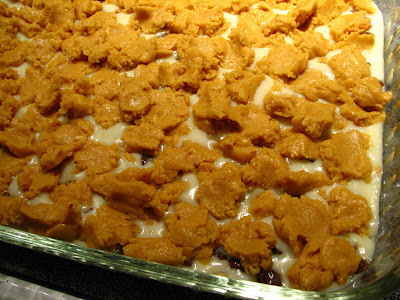 But my whole family enjoyed them, even if they didn't turn out to be the chewy, gooey bars of our dreams! Preheat oven to 350 degrees F. In a large bowl, mix the cake mix, eggs, butter and peanut butter together. Press half of the mixture evenly in a 9x13 inch baking pan. Bake for 10 minutes in the oven. 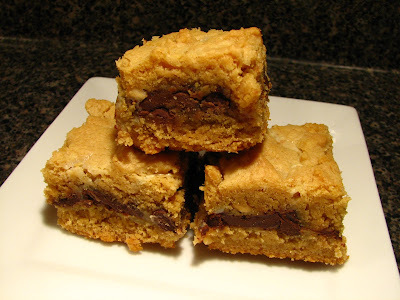 Remove from the oven and sprinkle with the chocolate chips and drizzle with the sweetened condensed milk. Crumble the remaining peanut butter mixture over the top. Place pan back in the oven and bake for 25-30 minutes until golden. Remove to a wire rack and cool completely before cutting into bars. Enjoy! A perfect snack for any occasion! Note: To make all chocolate peanut butter bars, just use a chocolate cake mix with the chocolate chips. Oh would my family ever go for these! Gone in a blink. I am very unimaginative when it comes to baking. I add chocolate, reduce sugar and call it a day! Mmm... scrumptious pb bars! I would love to have one right now! Lynda, thanks for your comments about how these bars turn out. Often a recipe ends up different from what I would think, but don't seem to relay that information. I, too, would think by the ingredients that these bars would be brownie like. Even though they weren't what you expected they sure look delicious. Peanut butter and chocolate are two of my favorite ingredients. These bars are calling my name - they look so amazing. I love peanutbutter! This looks so good....I wanna lick my screen! I am making these for Sundays game..easy and deeeelicious! Much thanks! They look delicious! 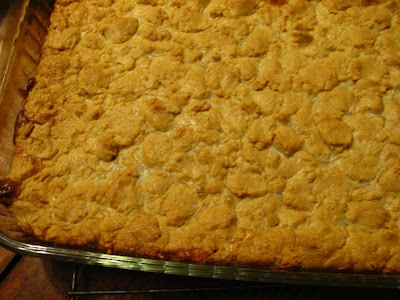 Paula Dean's gooey butter cakes all start with a dry cake mix for the crust and taste delicious. I have all of her recipes for gooey cakes listed on my blog. Thanksfor sharing! Love the idea of using a cake mix like this! Doctor it up, it's yours. Who cares if somebody presifted the dried ingredients for you! This is a great recipe!! I love that filling! Would be a great reason to go out there and buy a cake mix! Those look delicious! I'm definitely going to have to try them soon. They may not have lived up to expectations but they still look scrummy. I sent these to my 16 year old daughter's calculus class for a special day they were having. My daughter came home and told me I had a lot of new boyfriends. She said all of the boys in the class said, "Tell your mom we love her." mommydearest- Isn't it great to be a popular mom? 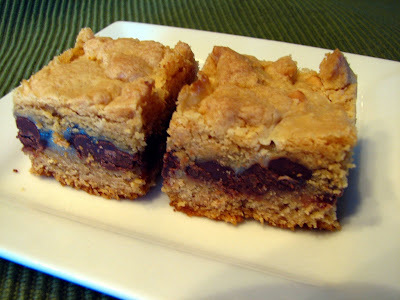 I'm so glad that these cookie bars were a hit, and glad that you left me comment! Thanks bunches! Chicken Pomodoro - Great Food in 30 Minutes!